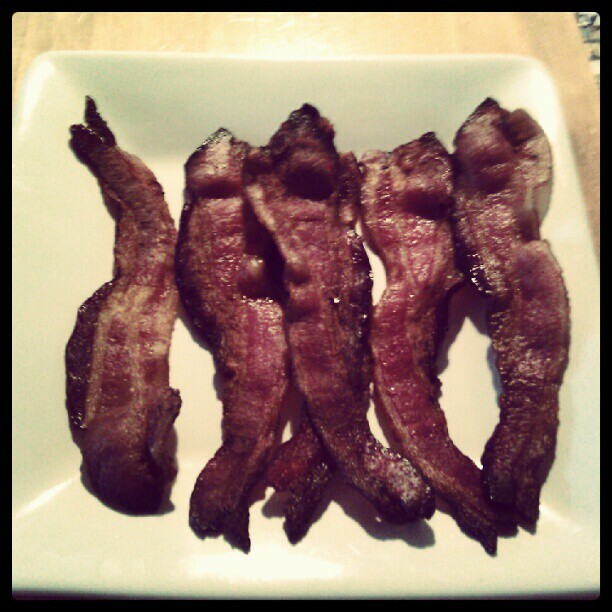 Cooking, Cronk, and Two Crazy Dogs: Don't Pan Fry Your Pork...Bake Your Bacon! Bacon - lots of people love this smoky, salty meat. However, different cooking methods can have some drawbacks. Pan frying bacon in a skillet requires somewhat constant attention and turning, and the bacon sits in its own fat. Microwaving bacon produces uneven results. The solution - bake your bacon! Line a baking sheet with aluminum foil, then place a wire rack inside it.The rack elevates the bacon, so the grease drips away, and the foil allows for quick cleanup. Lay the bacon strips on the rack. Try to keep space between the strips. Bake at 400F for 15-20 minutes, until crisp, but not too dark. Move strips to a paper towel lined plate, add another paper towel on top of the bacon, let rest for five minutes, and enjoy! I'm using this batch in a Swiss and Bacon Dip, which is an easy, tasty appetizer. Thanks! Will try this for our next party coming up.